Best Starter: Corn Bread with Bacon Marmalade, Range (Washington, D.C.). The first morsel I ever tasted at Bryan Voltaggio's sprawling Friendship Heights outpost was one of my all-time favorites. The sweet and smoky bacon marmalade was sinfully delicious and unforgettable. Honorable mentions: Bread Basket, Le Diplomate (Washington, D.C.); Chilled Pea Soup, Blue Hill (New York, N.Y.). Best Salad: Beans Salad with Sugar Snap, Green and Yellow Beans, Toasted Hazelnuts, Eataly (New York, N.Y.). On a sweltering hot summer day, a recharge lunch in Manhattan Italian food mart Eataly turned into a surprisingly delightful lunch, the highlight of which was this salad of contrasting textures. Honorable mentions: Misticanza, Casa Luca (Washington, D.C.); Salad of mixed greens with idiazábal cheese, Jaleo (Washington, D.C.). Best Pasta: Smoked Potato Gnocchi with Duck Ragu, Casa Luca (Washington, D.C.). After having been wowed by last year's visit to Fiola, we were just as impressed with Chef Fabio Trabocchi's new casual downtown restaurant, where Chris had this incredible gnocchi. Honorable mention: Tagliolini with Porchetta and Smoked Mozzarella, Osteria Elisir (Washington, D.C.). Best Meat Dish: Pork Chop for Two with Stuffing, Ma Peche (New York, N.Y.). Chris teased me for a long time about my interest in Momofuku. Then I took him to one of David Chang's restaurants. He doesn't tease me anymore. We were both smitten with Ma Peche and especially this amazing pork dish, which was the inspiration for what I served us on Christmas this year. Honorable mentions: Pork and Foie Gras Canelones, Jaleo (Washington, D.C.); House-Made Bratwurst, Grüner (Portland, Ore.). Best Seafood Dish: Lobster with Heirloom Tomatoes and Eggplant Puree, a(MUSE) (Rehoboth Beach, Del.). There was a lot to love about the tasting menu we enjoyed last summer at a(MUSE), but I chose this lobster dish because I loved its artful presentation and the honey-paprika sauce that accompanied it. Honorable mention: Arctic Char with Summer Squash, Table (Washington, D.C.). Best Pizza: Salsiccia Dolce, Posto (New York, N.Y.). We've enjoyed the pizza at Posto for years, but I didn't write about it until this summer. We've tried several pies there, but we always come back to this sausage, caramelized onion and basil pizza, which is our favorite pizza anywhere these days. 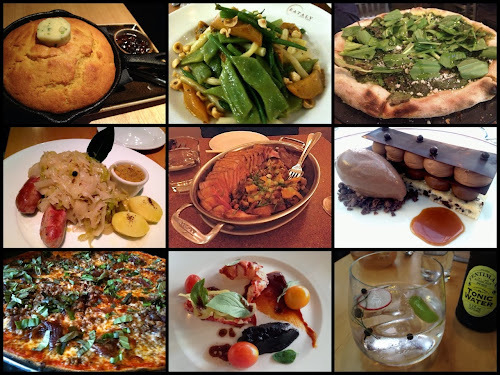 Honorable mention: Luigi (ramp pizza), Graffiato (Washington, D.C.). Best Roast Chicken: Roasted Barbecue Chicken, Blue Duck Tavern (Washington, D.C.). Although roasted indoors, this juicy bird had all the flavor of outdoor barbecue thanks to its brine. It inspired my own experiment with Smoke-Brined Oven BBQ Chicken. Honorable mention: Peruvian Roast Chicken, Del Campo. Best Dessert: Dark Chocolate Napoleon, Le Diplomate (Washington, D.C.). The beginning bread basket and closing dessert were the highlights of our meal at Le Diplomate. I loved this architectural wonder of a dessert, a chocoholic's dream. Le Diplomate still has this on their menu, although their pastry chef, Naomi Gallego, is now cooking at Blue Duck Tavern. Honorable mention: Coffee Mousse with Hazelnut Dacquoise, Del Campo (Washington, D.C.). Best Cocktail: Vegetal Gin & Tonic, Jaleo (Washington, D.C.). Spanish-style gin & tonics have become very popular this year. One of the best places to enjoy them in D.C. is at the Jaleo bar, where you can watch the bartenders craft them with assorted aromatic touches. Honorable mentions: Agave Stinger, Commerce (New York, N.Y.); Playground Meltdown, Range (Washington, D.C.); Martinez, Graffiato (Washington, D.C.). Best Service: Del Campo (Washington, D.C.). I ate at Del Campo several times, and during each visit I was impressed with the friendly, knowledgable service from a staff that was clearly interested in what was coming out of the kitchen and made me feel right at home. Honorable mentions: Blue Hill (New York, N.Y.), Graffiato (Washington, D.C.). Best Overall Restaurant Experience: Range (Washington, D.C.). In theory, Range shouldn't succeed. It's a giant restaurant in a shopping mall with a menu that covers every base from Italian to seafood to steak (it even has a cigar lounge). But both diners we ate at Range were remarkably good, proving the restaurant's name could aptly apply to how well it pulls off such varied dishes. Honorable mentions: Del Campo (Washington, D.C.).a(MUSE) (Rehoboth Beach, Del.). 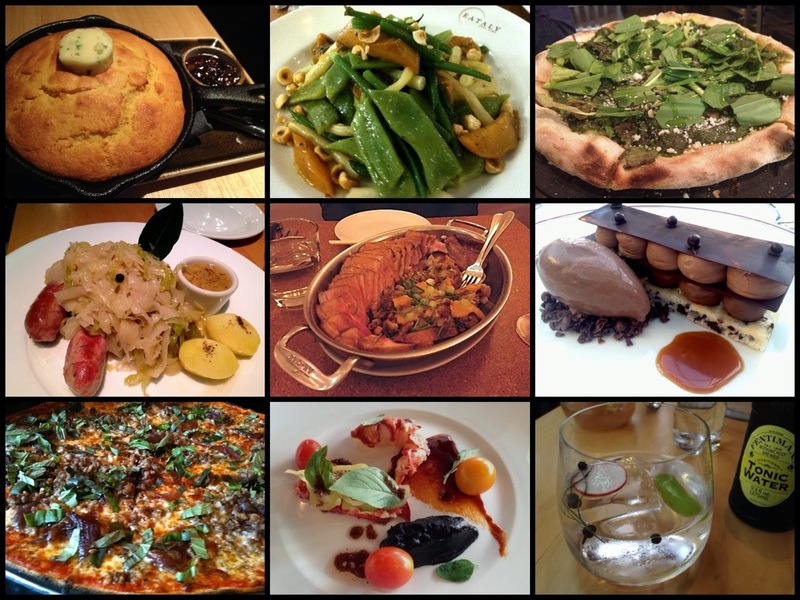 Nice roundup of restaurant reviews. We're lucky we get to eat in so many nice places. I like your recipes. Casual dining doesn't have to be a cumbersome affair. At Pizza Hut one can go for casual dinning by relishing different types of pizzas in its warm, relaxing environment.